Any time the forecast calls for rain, residents in Fort Worth's Arlington Heights neighborhood pay extra close attention. 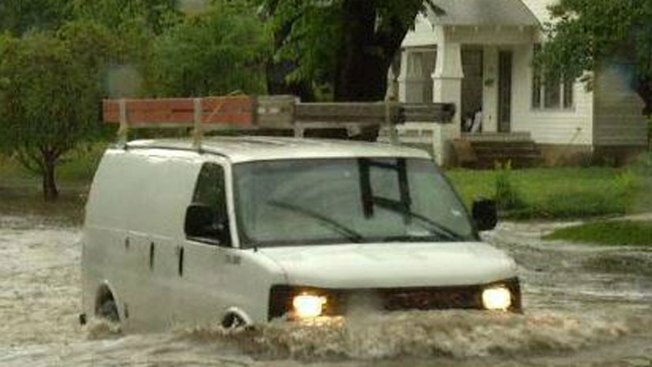 That's because flooding has often hit several areas, including Western Avenue, where too much rain too fast can fill the streets with water. However, a long-awaited fix to that flooding problem has many residents feeling a bit better about the impending wet weather. If you peer into the construction site hole on Western, you can see just how narrow the existing pipes are below the roadway. They're being replaced by giant box culverts, concrete boxes that will store thousands of gallons of water under ground and not on the street. "It was pretty bad last winter," said resident Cary Peach. "It took us by surprise. We could have surfed in the middle of the street. All these houses over here (on the east side of the street) got flooded. These up here (on the west side) weren't so bad." Peach is talking about the deluge of rain on April 13, when rain fell so quickly Western filled up with water up to near waist-deep levels. It's the latest in the long line of floods and subsequent damage. "Several of us have had to remodel our homes a couple of times in the last few years," said Andy Jones, another resident. Jones and many others will be watching the radar closely this weekend but hope the construction on their street will pay off. "We think the new work that they're doing is going to take care of the problem," Peach said. "We're just excited that the city is finally putting something into place to fix this," said Jones. "We feel good about it." The $5.7 million project took much longer to get done than residents would have liked. It's on time and on budget to be finished next July. The giant box culverts will rest nearly 30 feet below the roadway in parts. In addition to the improvements on Western Avenue, there's also a surface retention pond at Bryce and Hulen nearby. It will hold 554,000 gallons of water, according to the city's storm water department. The entire project will hold nearly 1.4 million gallons, which the city hopes will at least minimize if not completely eliminate the flood problem. But with this week's storm system the first real testy of rainy weather, no one is assuming the problem is solved just yet. "I think we'll be on alert the next few days and hopefully it doesn't slow the construction crew down too much," Jones said. Western is one of 300 locations across the city that storm water crews have checked prior to this rainfall. There are also 51 spots in the city equipped with flood warning signs. Those, too, are checked regularly.